If you're looking for the perfect gift for that supportive and proud family member this holiday season...Fa-La-la-la-la with family badges ! They're beautiful, custom-made miniature badges that you can create for your loved ones. Smith & Warren has so many beautiful options for you to choose from! Using our famous Build-it, See-it, Buy-it program you can cruise around, clicking and choosing which style, color, font, wording, and seal you'd like. Chief's wife? Mother? Captain's daughter? 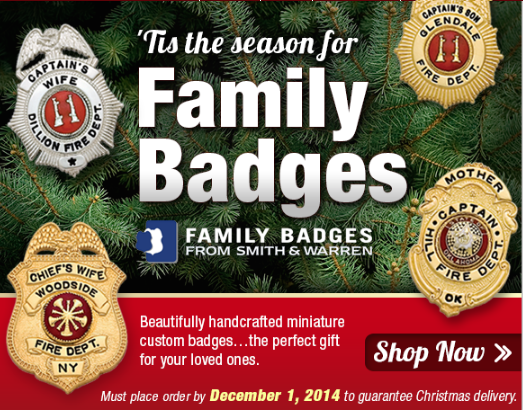 Whatever it may be--give the gift of custom family badges this Christmas and watch the smile come across their face. The gift of customization means you went the extra mile, your gift took some extra thought. So if you're struggling with what to get your mom, wife, dad, son-perhaps this is it! Remember-with custom items comes a little bit of extra time for your product to be made. So get your orders in by December 1st to guarantee Christmas Delivery. This year, put a smile on someone's face with the gift of miniature Family Badges. You won't be sorry! Click here to build yours today.